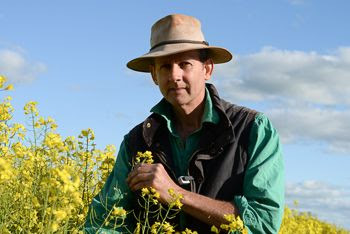 It’s very important to be nimble as a farmer, and the only way you can be nimble is to use the seasonal forecasts and have different options available to you, and so as the season unfolds, you can go down one path or you can go down another path by having a number of different crops at your disposal. Our property, Inverloch, has been in the family since 1849. We’re 6th generation farmers. Samuel Stinson, my great, great, great-grandfather on my mother’s side, came from near Londonderry in Ireland and settled at north Berry Jerry and took up 40,000 acres [over 16,000 hectares]. At that time there were just wild horses, cattle, kangaroos and emus there. This house [Andrew’s house] was built in the 1930s, when my grandfather married. My parents have a farm that I grew up on, and I now run it in partnership with my brother. This is my uncle’s property. We have been leasing this land from him, and this year  I take over full ownership. We have an investor who is looking for more land for us in this region so we can scale up. One lesson from the drought is that we found we need to do things incrementally. Our current acreage is not enough so I still do farmer consultancy work. The farm generates more income, but this is not always reliable and the off-farm work pays grocery and living expenses. 800 hectares would be good. We are looking to double initially and then look at the next step. I like the balance of consulting and farming. It is an opportunity for me to increase the level of awareness about seasonal forecasting of not just our business, but farms throughout southern New South Wales. As a consultant, my role is to work out what is viable or not for a farming family. The federal government’s climate predictions for 2030, 2050 and 2070 in this area show that we will have higher temperatures, more wind, more-frequent frosts and more cloud-free days. Given how dry it has been here over the last 4 years [2011-2015], I’m convinced that the climate will also be drier. We have had some extremely dry seasons. 2006 was a complete failure. I am now working on a growing season that is one month shorter than it used to be. Instead of relying on October rains, we try and get crops in early enough in autumn to reduce the risk of excessive frosting and get our crops through before October. At the beginning of the season there is frost, and at the end of the season there is loss of rain. With the exception of 2010, which was a La Niña year, the spring seasons have been very dry. This is different to what I recall growing up and through my agronomy years. My dad agrees about this – there were always dry years, but a bumper year would usually follow a dry year. This has been less the case. In recent years, we have had OK starts and winters and then no rain at the end. You’d have to go back to the 1940s to find a run of dry years like we have just had. I use Climate Kelpie almost every day. I use it to look at the tools developed by the Bureau of Meteorology through the Managing Climate Variability program. In particular, I look at the 4- and 8-day forecasts and the wind. I have to pick days when I can spray. I also look at frost and temperature forecasts, and I use the radar. I read ENSO [El Niño – Southern Oscillation] updates all the time. The wrap-up is really good. I use Climate Kelpie first as it’s a short cut to the Bureau information relevant to my region. In my interaction with Bureau researchers as part of the MCV Climate Champion program, I have been impressed with their ability to generate and work with climate models. It is now embedded in my mind about the importance of managing climate variability and using seasonal forecasting tools. This knowledge has helped me in my discussions with others about agronomy, crop planning, machinery purchases and farming systems. With some of my clients, we have mutually decided to take their business back to lower cost, less risk, more diversity, more pulses, more alternatives. We discuss numerous trigger points, often based on what the seasonal forecasts are saying. I also like CliMate [also developed through the Managing Climate Variability program] as it shows me the historical figures and how we are tracking compared to other years. So last year , I knew our crop yields were likely to be well above average. I did some late application of nitrogen – a shotgun mix of nitrogen and herbicide to make sure the crops finished strongly before harvest. This was based on a forecast showing 60 mm of above-average rainfall in the growing season. It’s very important to be nimble as a farmer, given the variability of our climate, and the only way you can be nimble is to have different options available to you. So as the season unfolds, particularly through that March, April and May period, you can go down one path or you can go down another path by having a number of different crops at your disposal and taking a close look at the forecasts. In our first couple of years, we planted wheat and barley. After a few years there were paddocks that urgently required a break crop. I’m always looking for the simplest and most straightforward system I can implement that allows me to have good agronomic practices. So I introduced field peas to my rotations. I selected field peas because I think it’s in our interests to minimise the amount of fertiliser nitrogen we’re applying to save costs and reduce emissions, and a pulse crop provides an opportunity to do that. Because of the mix of soil types on this farm, other pulses, such as lupins, weren’t suitable across all soil types. Now I have 35% field peas, 15% canola and the rest is wheat [50%], compared to 2010, when it was all wheat, with one paddock of field peas. I’m now reducing my risk of denitrification and producing a high protein wheat or canola crop without having to risk late applications of nitrogen. The organic nitrogen left from the pea crop is released slowly over time. This means there is no big flush of nitrogen like you get with urea applications. 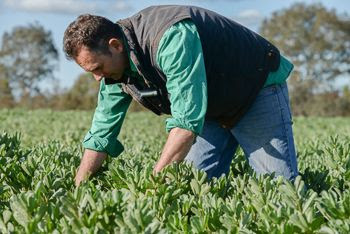 Last year  I also planted 5 hectares of faba beans instead of peas into my rotation. I can sow earlier with faba beans, but if there is no rain predicted using the Bureau of Meteorology’s forecasts, I can put field peas in a bit later instead. So this gives me a tool – one early crop and one late. This means I have a sowing period of about 8 weeks and lots of flexibility. I plan to sow more in the future to give me even more flexibility. After spending the best part of two decades as an agronomist, and walking through crops that were magnificent, returning to farming in 2006 was hard. To plant a crop of wheat and have it totally fail was an enormous shock to my confidence. It just went to show how precious water is to a crop. With forecast higher temperatures and a lack of rainfall, it is imperative that we retain as much moisture in our soil as we can. We retain our stubble to help with this. My intention was to put moisture probes in here, but Farmlink, a local farming organisation, now has probes throughout the district, so I can access their data. I can then compare notes with the growers who have these probes to look at year-to-date rainfall. If you know the soil type, you can make some assumptions. The yield forecasts from the probes are often similar to the forecasts generated by Yield Prophet. For me, anything we can do to increase our level of confidence in making decisions, particularly during dry periods, is a good thing. Knowing the likelihood of gaining that subsoil moisture depends on those seasonal forecasts as well as data from the moisture probes. Having the choice of a number of crop varieties makes me a more nimble farmer because I can go with a main-season wheat if I know I can establish that wheat variety on the moisture that’s available to me in early May. And I know if that moisture will likely be available by looking at the multi-week forecasts and moisture-probe data. I expect the main-season wheats to yield better than the short-season wheats. 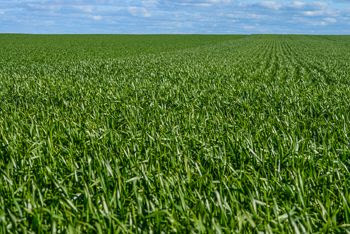 If I can establish a crop early, I’ll always plant an early crop, but if I don’t believe I’m likely to get enough moisture to establish this crop satisfactorily, then I’ll go for the short-season wheat and I’ll wait and plant when I do have adequate moisture. You do need to plant in the correct sowing window. If you plant too early, the crop will go through to maturity far too quickly, and therefore you’re at greater risk of being frosted. I plant two early-May varieties, Suntop and Lancer. 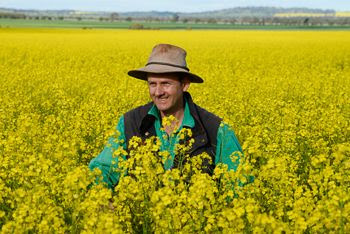 I’m having a look at a third variety to fit our latest likely sowing window, a very quick-growing variety called Viking. At harvest time, the most likely outcome is I’ll retain either Suntop or Lancer from the early-sowing wheat; I’ll retain the main-season wheat and – if we have a break in the weather that means we can sow late – I’ll definitely retain the Viking. Our Suntop wheat is sown at a time when we can best try to avoid frost. The wheat heads will appear in late September, and then the next couple of weeks are critical for us in terms of frost. Frost at the wrong time will mean that a crop is damaged very quickly, and our wheat yields will be reduced. If we get a frost, it might sterilise the head and affect the number of florets that go on to produce grain. It depends on the extent to which it gets frosted. If it’s a very severe frost and the crop is stem-frosted, we’ll have very low yields, and our only option is to cut it for hay or silage. But if the wheat has only been mildly affected – just part of the head or a proportion of the florets – we would most likely leave that crop in the ground and try to get it through the harvest. That’s why the Bureau’s frost forecasts are so important to us. Our farming decisions have been made to give us the best opportunity to produce a profitable crop, while avoiding a situation where we’re spending a lot of money producing a crop that we have no opportunity to harvest if the seasons are bad. My biggest decision is how to set up the business from a cost-structure point of view, so that I don’t have too much money invested in plant and equipment. As much as the next bloke, I’d love to have new machinery. But at the moment, with the way the seasons have been, I don’t feel it’s justifiable. I’ve been forced into a situation where I have to run a second-hand, low-cost seeding unit. I have a direct-drill combine, which cost me $15,000 to put together. Two-thirds of that cost is in the press wheels and the sowing boots. In my view, you put the money where it really counts. 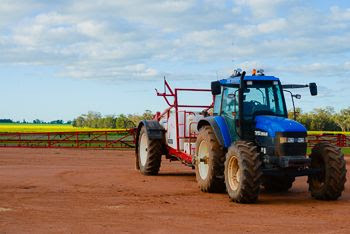 I’ve invested in things like press wheels, having accurate seed placement, low-drift nozzles on my boom spray to maximise spraying opportunities, and an auto-steer unit so I can spray at night and sow into stubbles. The seeder I use allows me to moisture seek. I don’t have the scale for a disc seeder yet, but the emphasis is on retaining the moisture and groundcover and spraying out weeds. Groundcover is the trash of the year before. My operation works out at a cost of about $22.60 per hectare or roughly $9.00 per tonne, assuming a crop yield of 2.5 tonnes per hectare. So it’s very cheap, but it still allows me to do everything that a much more expensive seeding unit would allow me to do, as far as drill straight into stubbles and retain the stubbles we’ve got. I, along with others in my area, have modified our seeders to install a press wheel behind each tine. 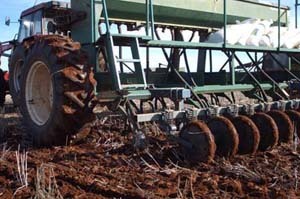 The tine will shift the stubble and the soil to the side, creating a slot. The press wheel will follow, compressing the soil back to give you that seed-soil contact that you need for the seed to germinate. This allows us to sow in situations where we would not normally be able to sow, for example, soils with marginal moisture levels. There’s been a trend back to livestock. I am buying store lambs and finishing them over summer on the pulse stubbles and then putting them into a feedlot – that’s been a very good money-spinner for us over summer. 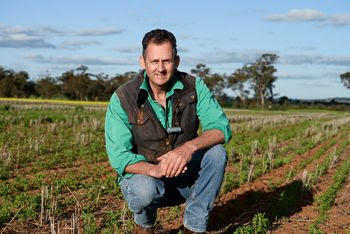 Many continuous croppers who had taken sheep out of their farming system have now put them back in or are thinking about it and, at the very least, are varying their crops. This again gives us options for better managing a variable climate. For example, if your crops yield less because of a dry spring, then you have an opportunity to trade lambs and generate extra income. It also helps in cycling nutrients more rapidly, as lambs consume stubble and then excrete it. If you have the fences and infrastructure, you can easily put lambs back if a bad year’s predicted for cropping. You have to be ready to change and change quickly. You have to be nimble as a farmer. You can’t lock yourself in; you have to be able to make decisions quickly, especially as the climate becomes more variable. The MCV Climate Champion program has broadened my thinking about climate variability and change. I am not as negative about this as I used to be. I know we are going to have massive swings, but there are opportunities to look at the climate model forecasts and make some decisions. It comes back to being nimble. I am not locked into canola and wheat crops being sown at set times of the year; I have options. Other farmers have now also come on board. There are more sheep back – they were an endangered species a few years ago. There’s now more diversity of crops. This means there are a lot more nimble farmers out there who are better able to manage their climate risks.